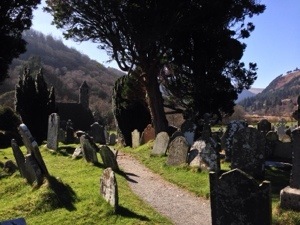 Glendalough is in the heart of county Wicklow, this beautiful green valley, with two shimmering glacial lakes nestled between lush, sloping mountains and noisy waterfalls. It’s name derives from the Irish (Gaelic) Gleann Dá Locha, meaning “valley of the two lakes.” The sheer beauty of the landscape here makes it easy to understand why Wicklow is often referred to as “the Garden of Ireland”. Like so many Irish havens, Glendalough is rich in heritage, having been founded as a monastic settlement by St. Kevin, around 700AD. The community went on to become a European monastic capital in the Middle Ages, when Ireland was known as the “Land of Saints and Scholars”. Many buildings dating from this era add both beauty and magic to the site. Famous among these is a 34-metre high round tower, probably built in the 11th century. The tower’s girth is also impressive, and it has been exceptionally well preserved, in contrast with similar structures throughout the country. The remains of a cashel (small castle), a cathedral, several stone churches, and many Celtic crosses and other embellished grave markings can also be seen. The area’s geographical isolation, amid the sparsely populated Wicklow Mountains, perhaps explains why the round tower was never sacked during the waves of invasions and wars suffered by the Irish from the Middle Ages onwards. 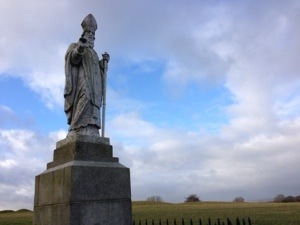 Indeed, this isolation is also why St. Kevin founded his hermitage here, as he reputedly came from the more prosperous farmlands of Kildare, but desired a home of prayerful solitude. 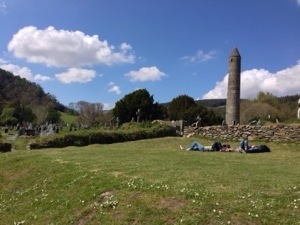 The sense of “getting away from it all” is retained in Glendalough today; the area is popular with pilgrims and walkers, and there are many well-marked walking routes of varying lengths around the upper and lower lakes. St Kevin’s journey started at such a place, called Hollywood. It’s still there, a perfectly lovely little village. Some time in the early 7th century he set out barefoot. As the heather turned to rocks and foul weather set in, St Kevin battled on, finally reaching a high pass so desolate a lesser man might have fallen to his knees in dread. Suffering in the wilderness, however, is sweet justification to a pilgrim. Ahead lay promise. A snug valley, a sweet brook tumbling, protection offered by wooded hills. St Kevin plunged forward and found his destiny. A monastery known as Glendalough was later established in the valley, a magnet for many thousands of visitors to County Wicklow today. The remainder of St Kevin’s life, it was nothing beyond a hermit’s retreat. 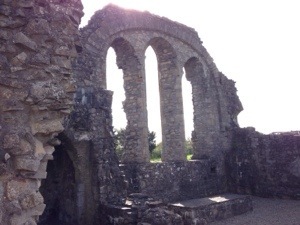 He lived alone on St Kevin’s Bed, a rock above a lake, where the holy man battled the demons of temptation – black knights, he called them – and he died there, still contemplating mysteries, in 618. St Kevin’s greatest distraction, legend has it, was a woman who was determined to relieve him of his virtue. St Kevin threw himself into a bed of nettles to avoid being seduced and set fire to a handful of burning weeds to fend off his pursuer. When all failed, the poet Gerald Griffin later wrote, St Kevin ”Hurl(ed) the maiden from the rock into the black lake shrieking”. But that, surely, was merely ghastly myth. 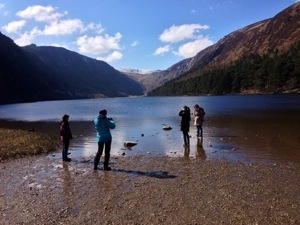 Join us on a spectacular half day Wicklow and Glendalough tour from Dublin. Max 16 persons on our fully guided tours. Newgrange (c 3,200 B.C.) 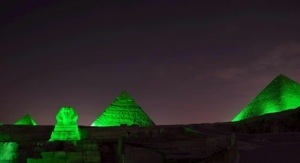 predating the ancient pyramids by 400 years and Stonehenge by 1000. The passage tomb is surrounded by 97 kerb stones, the most impressive is the large entrance stone which is covered in swirls and designs. Inside the large mound there is a long passage leading into a chamber which branches off three ways. The corbelled roof inside the burial chamber it still watertight and supports an estimated 200,000 tonnes of cairn. The cremated remains of the dead were laid on large stone basins inside the chamber which usually were accompanied by grave goods. 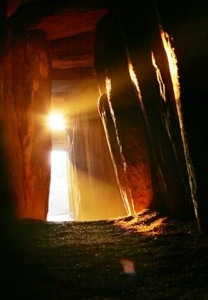 At dawn on the winter solstice, the shortest day of the year (December 21st), a shaft of sunlight enters the chamber of Newgrange through a specially designed opening over the doorway which illuminates the Chamber..
St. Patrick a foreign Christian missionary come to convert Ireland’s Celtic pagans. This he did with great symbolic flare. 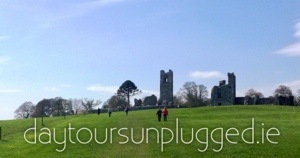 As the Druids celebrated their feast day on the Hill of Tara, Patrick prepared the Easter feast on the Hill of Slane. He lit his paschal fire at Slane, before the Druids could kindle their sacred fire at Tara. Seeing the flames at Slane, the Druids, warned Laegaire, the High King, that if Patrick’s fire was not put out immediately, it would burn forever in Ireland. 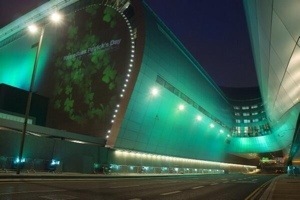 The rest is history, shamrocks and an Island without snakes. 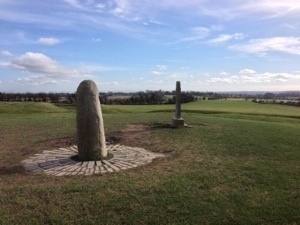 During the Bronze Age royalty would gather at the Hill of Tara to honor the passing of someone whom they respected. 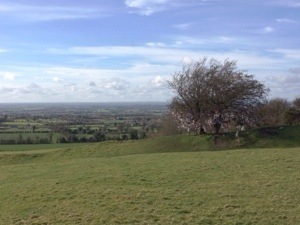 The Hill of Tara is the source of many Celtic legend. The ancient Irish site has chariot roads, which radiate throughout Ireland. Your guide will take you on a walking tour across this spectacular hill to the Lia Fail or Stone of Destiny, which was the centre of early kingship and ritual, where contenders had to circle their chariots around the stone until their hubs screeched against its granite base. 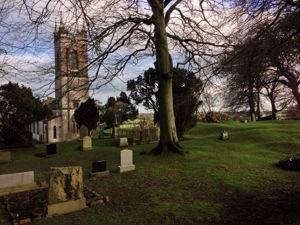 Our guide will also take you through a churchyard to see a figure carved into stone, which is thought to be that off Cernunnos, the God of the Celts. Explore the mound of the hostages, which became the tomb of a young princess who was buried with a semi-precious necklace, which was possibly from Egypt. This is a remarkable location in the centre of Ireland, enjoy remarkable vistas across 23 of Ireland’s 32 Counties. 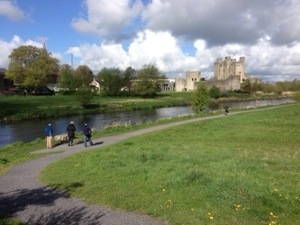 This is an area of outstanding natural beauty located in County Meath Ireland. Join us today on a fully guided day tour and follow in the footsteps of our ancestors as we discover 4000 years of History. To book your seat with us call Day Tours Unplugged on +35318340941 or simply make a secure online booking today. During this day tour we will also visit Newgrange, and Monasterboice, home to Ireland’s most spectacular Celtic crosses. 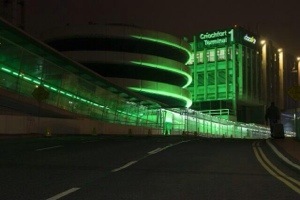 It has finally arrived St Patrick’s weekend … Let’s go green! ah Patrick Saint Patrick was a 5th century Romano-British Christian missionary and bishop in Ireland. Known as the “Apostle of Ireland”, he is the primary patron saint of the island along with Saints Brigid and Columba. The dates of Patrick’s life cannot be fixed with certainty but, on a widespread interpretation, he was active as a missionary in Ireland during the second half of the fifth century. He is generally credited with being the first bishop of Armagh, Primate of All Ireland. When he was about 16, he was captured from his home and taken as a slave to Ireland, where he lived for six years before escaping and returning to his family. After becoming a cleric, he returned to northern and western Ireland as an ordained bishop, but little is known about the places where he worked. By the seventh century, he had already come to be revered as the patron saint of Ireland. 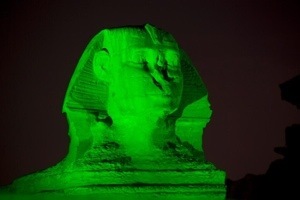 Saint Patrick’s Day is observed on March 17, the date of his death.It is celebrated both inside and outside Ireland, as both a religious and, especially outside Ireland, secular holiday. In the dioceses of Ireland, outside Ireland, it can be a celebration of Ireland itself.